Meade Variable Projection Camera Adaptor 1.25"
The Meade- Variable Projection Camera Adaptor includes a sliding mechanism, permitting variable projection distances during eyepiece projection photography, avoiding the need to switch to higher power eyepieces when additional projection enlargement is desired. 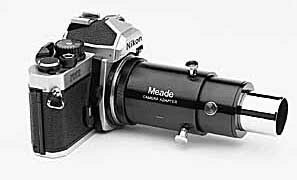 Each complete adapter consists of two separable units for either prime focus or eyepiece-projection photography. Basic and Variable-Projection Camera Adapters should be used with a T-Mount, available separately, appropriate to your brand of DSLR camera (Canon Nikon etc).